Learning how to weigh weed accurately is important for three reasons. First, you won't accidentally get shorted by your dispensary. Second, you’ll have a better understanding of the basic cannabis measurements. Thirdly, if needed, you’ll know how to make edibles and measure the amount of THC that's in each piece. Common sense says that when weighing cannabis you need a scale and a nug, but there is little more to the process than just that. If you are going to get technical, you’ll need the correct equipment. Usually, when the cannabis enthusiast is serious about weighing out precise measurements of marijuana, they’ll have invested in a scale. A digital scale, with at least two decimal places, is a fundamental piece of equipment. You’ll also need a suitably sized tray or dish to place your cannabis on during the weighing process. A small dish avoids direct cannabis-to-scale contact, which keeps the scale clean and resin free. Finally, you’ll need to get your hands on some marijuana, but that part should be easy. Whatever container you're using to contain the cannabis, place that on the digital scale first. This step is about finding the tare weight or "zeroing out" the container. Setting the tare is important because it will remove the container’s weight from the final measurement. Once you've taken the tare weight, place your weed in the dish. Within seconds, a digital readout should appear on the screen. This is the total weight, without including that of the container. What are the Standard Measurements of Cannabis? Hopefully, if you’ve already made your purchase, you’ll have a basic understanding of the standard marijuana measurements. Cannabis is almost always sold in a set of standardized empirical measurements, even outside of the US. In increasing order, the basic measurements are a gram, an eighth, a quarter, a half, a full ounce and a pound. The measurements represent a fraction of an ounce, for example, an eighth is shorthand for ⅛ of an ounce and a quarter is ¼ of an ounce. An Eighth, a Quarter, an Ounce What Are Those? While these measurements are commonplace, they might not make the most sense to those unfamiliar with imperial values. You might be asking for the metric conversion. One gram of cannabis is one metric gram—It's as simple as it gets. One-eighth of cannabis equals roughly 3.5 grams. One-quarter of cannabis equals approximately seven grams. A half is not surprisingly double that of a quarter, so that makes 14 grams. Finally, a full ounce of weed tops out at just over 28 grams. Just when you thought you had a full understanding the measurements, someone throws you a curveball during a transaction. A dime bag? A nickel bag? Increasingly only used by old timers holding on the language of the past, you may still hear these slang terms used once in a while. Dimes and nickels were common terms used when cannabis was more stigmatized than it is today. A dime bag meant roughly $10 worth of cannabis, nowadays this is typically a gram. A nickel was not surprisingly $5 worth, which was just enough to roll a small joint. These terms are more used with schwag, which is something that has thankfully fallen from province. What Types of Scales Should You Use for Weed? As mentioned, most experienced smokers rely on digital scales to weigh out marijuana. Digital scales are often sold at dispensaries and head shops, although there are less accurate versions sold in the baking section at department stores. If you are serious about accuracy, try to find a digital scale with at least two, if not more, decimal places. Baking scales work for smaller quantities, although for higher precision look for a jewelers scale. Often digital scales come with a metric to imperial measurement conversion, which could be handy depending on where you live. If you are weighing more than the standard ounce, you might want to look for commercially-sized digital scales, easily sourced online. Way back when, before the digital age, scales were all analog. Analog means that instead of a computer, a physical system with actual weights and springs was used. Today, analog scales are outdated. If you want to keep it old-school and measure weed with an analog scale, you are going to be hard-pressed even to find one. They are also much more challenging to master, requiring a delicate hand and a keen eye. Arguably a quality digital scale has the potential to provide much more accurate readouts as well, down to two or three decimal places. But, if you want one, your best bet is going to be a triple-beam scale. What About Cell Phone Apps for Weighing Cannabis? Yes, there are many different cell phone apps out there claiming to weigh whatever you place on the screen, but do they work? While they make a good party trick, their accuracy is quite questionable. Cellphones do not come with an inner scale, and these apps instead rely on creative senor use. Essentially using other types of sensors to ‘creatively’ guess a weight. Cell phone apps claiming to weigh cannabis accurately are a scam. If you don’t believe it, do a side by side comparison between a real digital scale and your cell phone. Did you Know You Can Make Your Own Scale? If you can’t find a cheap digital scale, you can make a simple scale at home. Be warned, this isn’t that accurate, and you’ll only be able to weigh smaller quantities. 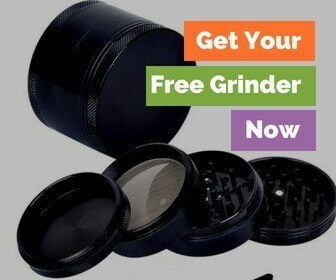 It's best suited for impressing your friends during your next smoke session, not for doing business transactions. There are a few different methods, but the one presented by Sativica only uses office supplies and is simple to set up. 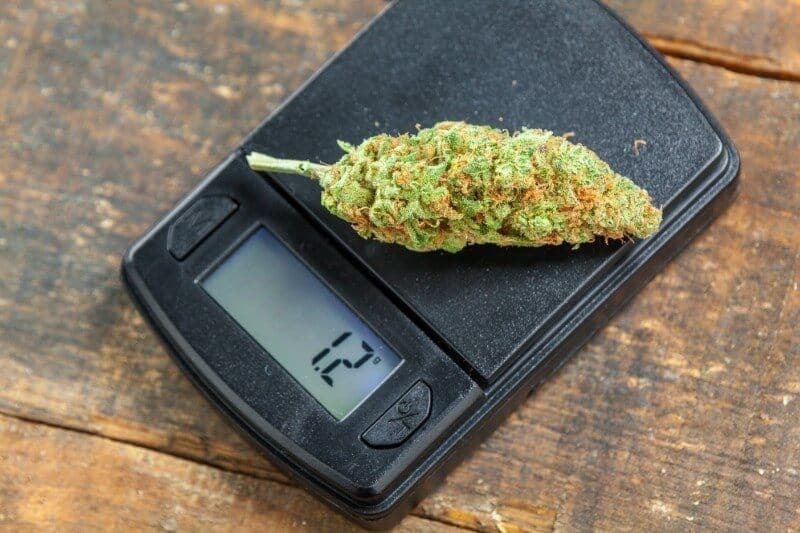 Why is It Important to Weigh Your Cannabis? Knowing just how much you smoke on an everyday basis is crucial to budgeting properly for your cannabis use. For medical cannabis patients, it’s even more critical to know just how much you are using. Typically, a physician will prescribe cannabis by a daily dosage, like one or two grams per day. Knowing how to weigh weed accurately can ensure you're getting the correct dose. If you want to make your dried out nugs weigh just a little bit more, there are a few tricks. Even if you aren’t selling any, it can also be helpful to know what tricks might be used on you. Moisture is the essential element that adds heft to your stash, increasing the moisture content increases the final weight. Some people place a wet Q-tip at the bottom of the bag, while others put a citrus peel. Either method works for rehydration, but be careful not to leave too much excess moisture in the bag. Excess moisture can quickly lead to mold and mildew development. Be careful to maintain only minimal levels of moisture in your bag. If you are going to be a cannabis consumer, it will be hard to do so without learning how to weigh weed. It is an essential skill, but one that's easily mastered. Learning how to weigh weed without a scale is another story. Your best bet is to try and make your own scale to weigh out what you need. Just try and avoid using a digital scale phone app because it won't be very accurate. 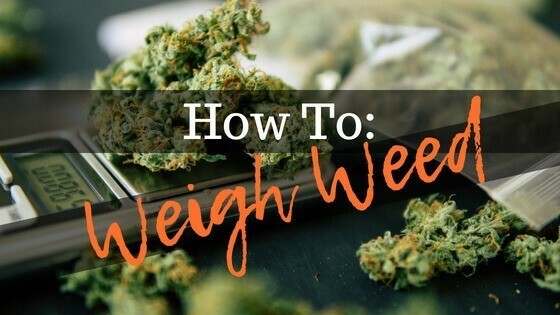 Did this guide help teach to weigh you cannabis? Let us know if there are any tricks or details that we left out!